Having pretty much convinced us all that life is a lot easier when your thumbs have less to think about, SRAM is today launching its next development which aims to keep the tiny brains in our thumbs from having to think too much. 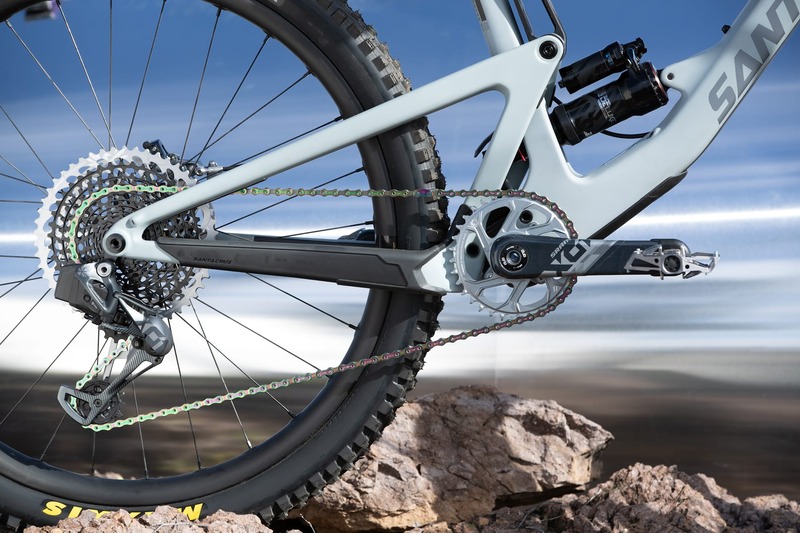 AXS is its new electronic and wireless line up, consisting of SRAM Eagle XX1 and XO1 groupsets, a RockShox Reverb dropper post, and – on the road side – Red eTap. What AXS introduces to the mix is wireless electronic operation, using the AXS platform. 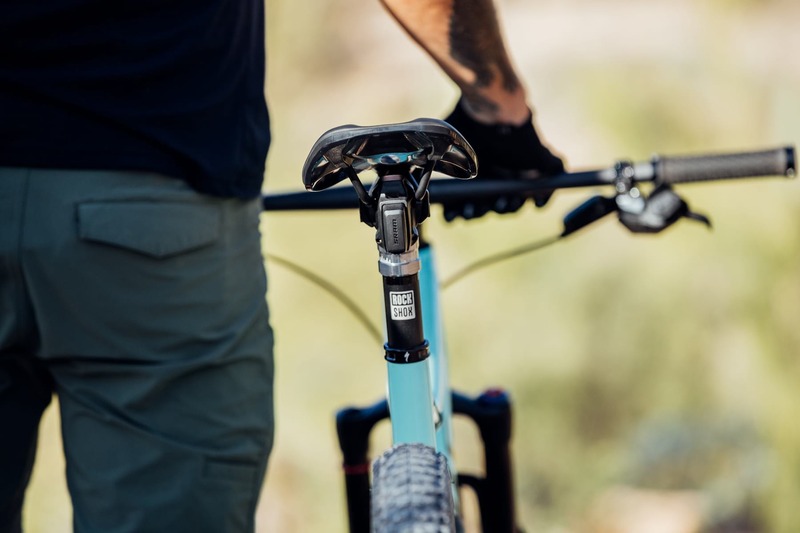 The drivetrains are designed to shift perfectly and predictably every time, at just a gentle press of a lever rather than the deeper shift of a cable actuated lever. Similarly, the dropper requires a more gentle press rather than the relatively long throw of current actuators. Such accuracy and predictability is likely a novelty for us mortal riders – something to have for the same reasons that we buy super cars, the latest iPhones, or titanium chain ring bolts. Because we want them, we like them, and we like having the latest new thang. The bike industry would be a much smaller scene if it weren’t for our love of such toys. If you’re not convinced, go to a sportive or watch a Cat 4 road race. For the professional racer though, this kind of shifting falls into the marginal gains that makes the difference between World Cup wins and watching the presentations from the sidelines. 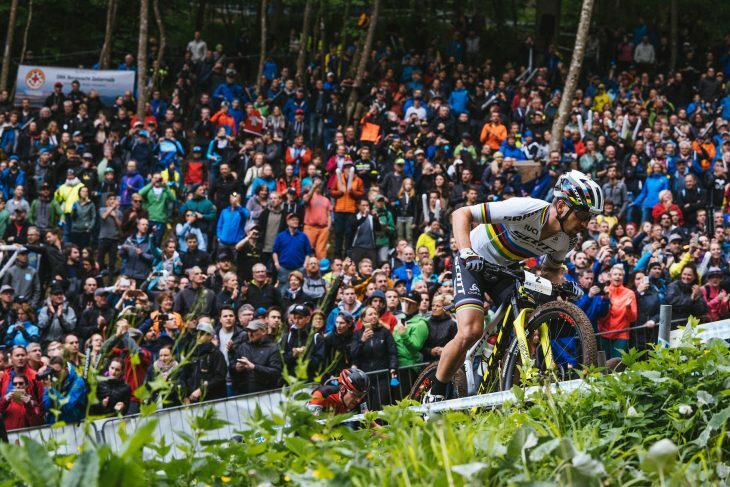 Nino Schurter has already won a number of races while racing the AXS Eagle XX1 drive train, and no doubt we’ll see the XO1 equivalent popping up on EWS podiums later this year. We’ve only had a quick car park test of the AXS Eagle X01 and AXS Reverb, but certainly the response from the mechanicals is instantaneous and precise. 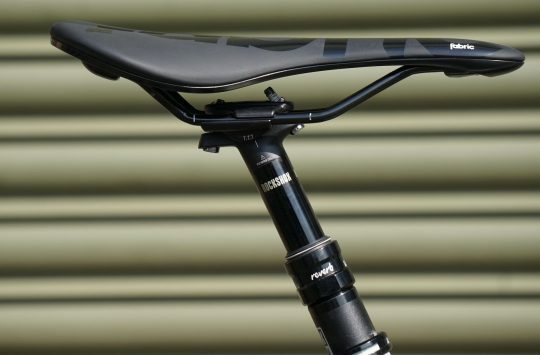 The Reverb drops swiftly without delay, and for those who like their saddles down just a notch for technical climbs, the precise actuation makes this much easier than a standard system. Hit me with your rhythm stick (or large rock). Shifting is also sharp and swift, but perhaps our favourite ‘ooh check that out, it’s like the future is here’ feature is the second clutch mechanism, designed to protect the derailleur from rock strikes. If you do whack the derailleur with a large rock (or a fist, for demonstration purposes), it shifts in towards the wheel, then resets itself with a quick mechanical whirr, back to the sprocket it was on before the hit. 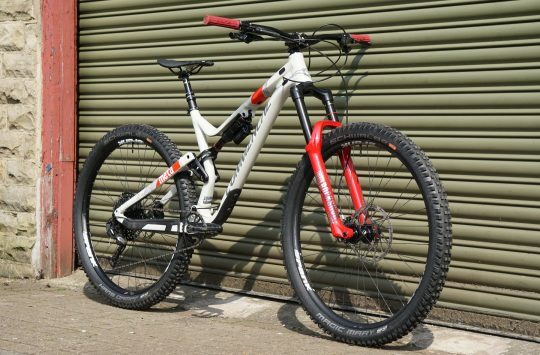 For the EWS racer, we can see that this will be far preferable to having to stop and re-index your gears while half the field sails by, or putting up with the jump-jump-crunch of gears gone wrong. The inside of the Reverb is much the same as existing Reverbs, though with some improvements to seals, and the addition of a ‘Vent Valve’ to easily release any air in the system that could cause the dreaded ‘dropper squish’. We’ve seen a similar feature before in the excellent Bike Yoke Revive dropper post. 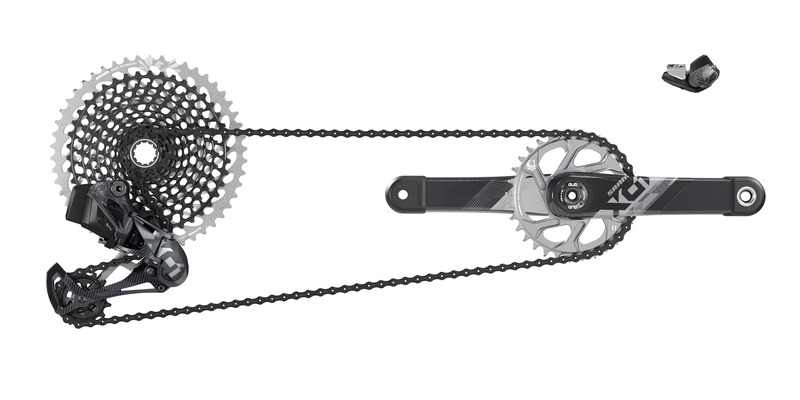 More significant differences in construction are apparent between the AXS Eagle and standard Eagle derailleurs. In order to create a wireless system, the construction is very different from a mechanical derailleur, with the internals containing gearing that looks like the inside of a watch. The small external battery is the same as on existing eTap technology, and it’s the same type of battery that operates the dropper post (so if you do a really, really, really long ride – maybe ride to and from a 24 hour race? – then you could always take your battery off your dropper and use it as a spare). But oh, rainbow unicorns. Mmm. The cassette, cranks, chainring and chain have also undergone some changes. 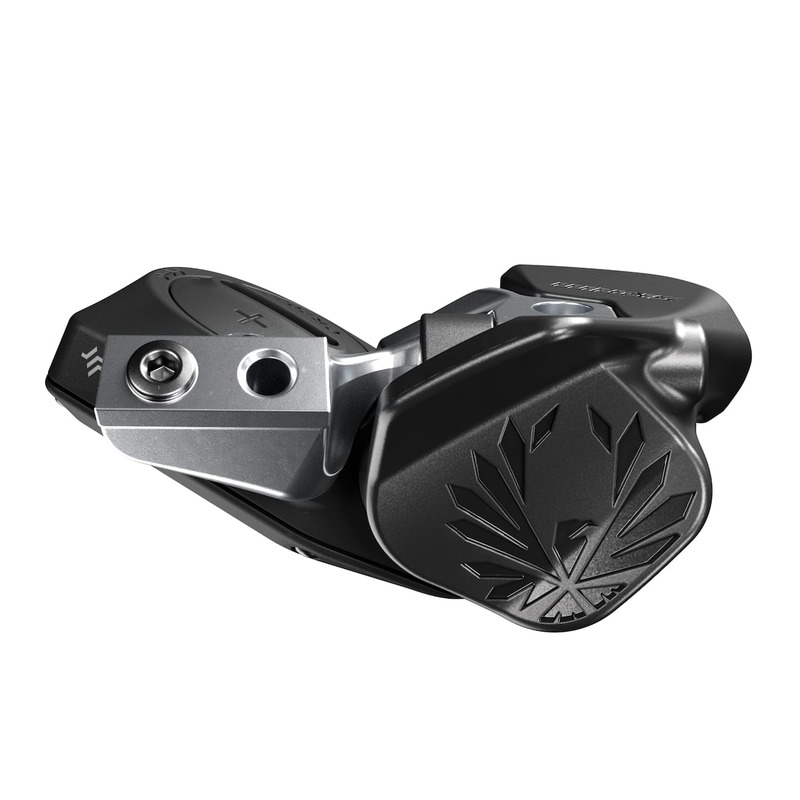 These are not specific to AXS functionality, and are the latest iteration of Eagle product, although to begin with they’ll only be available as part of the AXS groupset. If you’ve admired the rainbow oil-slick finish on Eagle quick-links, you’ll like these updates. 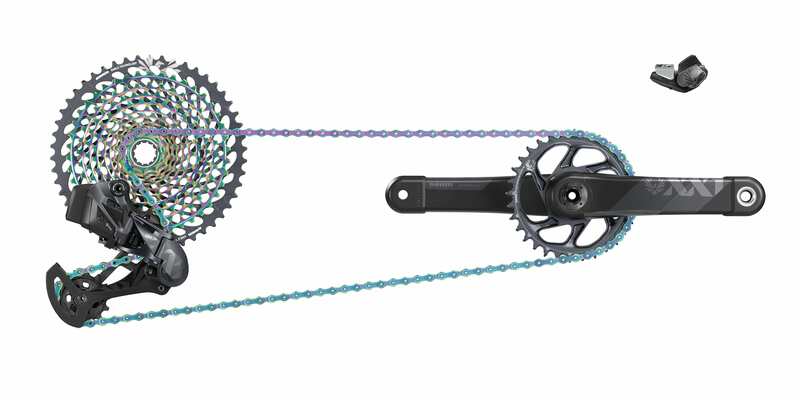 As well as some machining differences, XX1 gets a complete rainbow cassette, while the XO1 chain takes on the rainbow-unicorn hue. Hey, why not. We want it because we like it, not because we need it. The shifter and actuator consist of quite large paddle-like landing pads for your thumbs. Missing them seems largely impossible, unless you have really lost thumbs. They’re big. 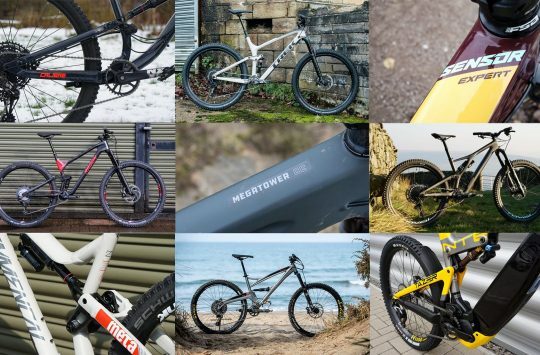 They’re also easily removed, which may be a particular boon for anyone wanting to swap the dropper post between bikes – with no cables to thread patiently (or not so patiently) through anything, one dropper between many bikes would certainly be possible. 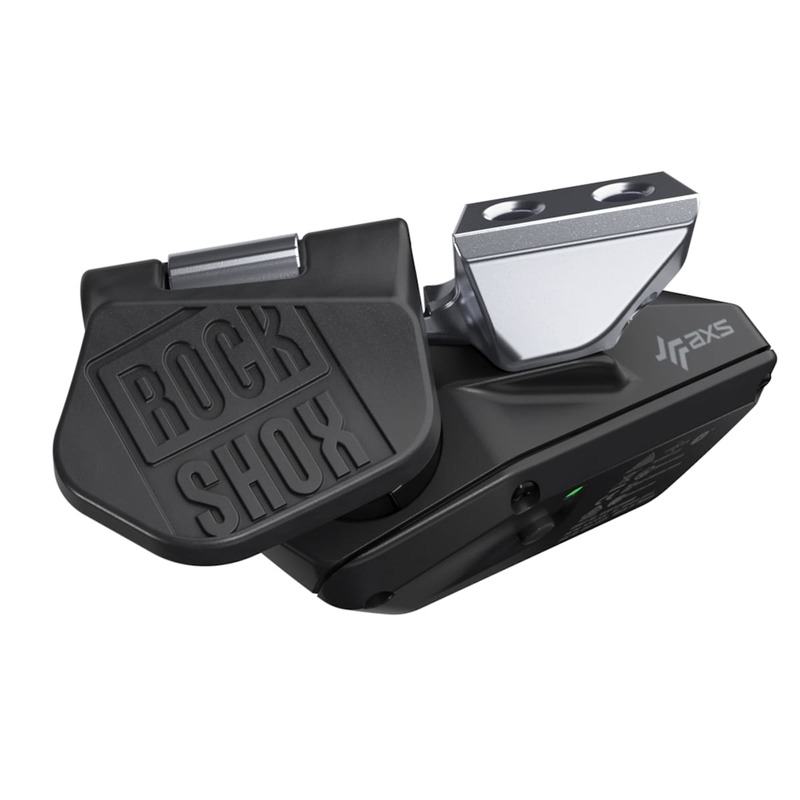 It says Rockshox, but it’ll operate your gears instead of your dropper if you like. Gravel riders may find some interesting mix and match options. For now, this cross-product integration may well be of most interest to the gravel riders, who could choose to run a mountain bike drivetrain on AXS eTap levers with a dropper post added for good measure. Or at least, you will in due course. At present, the products will be sold as complete groupsets, so anyone wanting to play mix and match is going to have to buy rather a lot of product. One final thing to note is that the it may be interesting to see what opportunities this new wireless system affords bike designers. SRAM’s 1x set up didn’t just free our thumbs, but also freed bike designers to give us shorter back ends, bigger tyre clearances and new frame shapes. What will taking out the need to route a cable through a swing arm or shock mount do for us? Watch this space. We don’t care why, we want this. Pardon me whilst I step out to sell a kidney. I want to see the individual costs. i’d only want/need the shifter and mech. I have Di2 on my road bike and wouldn’t ever go back to cables. Do you have your pricing correct there, X01 £50 more expensive than XX1? Oh the fun when someone hacks the wireless part. Stand by a track, or pootle along on your own bike, wait for a passer by and…. change! Something that has never reportedly happened with any of pro road teams that have been running eTap for the last 3 or 4 years. Is this going to be a standard on all of the Scott-Sram teams bikes? Or will nino continue to get special treatment? A bit fat nope from me..! @Th15663 Kate Courtney has been running it for a while, as have the Trek Factory XC team. I reckon it will be team-wide equipment this season. I’m interested to see whether Nino runs it at the Epic this year, he used a cabled setup last time but back then the etap setup he raced for XCO was still a prototype. Would this be good for jumping sharks? Remembering how happy I was with the 3 x 5 Shimano SIS system on my Raleigh Mustang; this is mental!!! Dam though that price. Roll on trickle down tech. 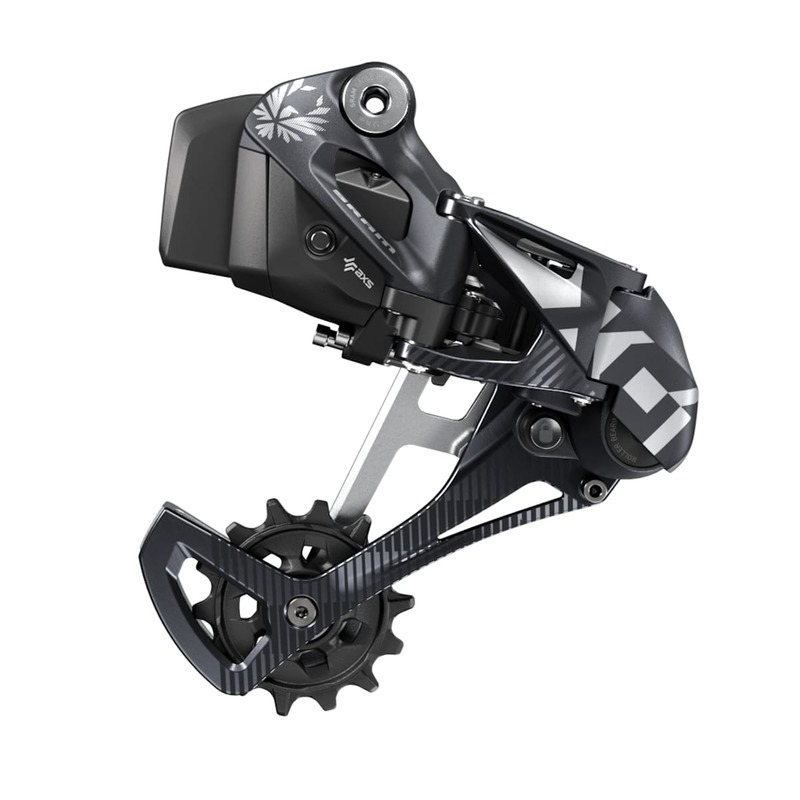 Great timing for SRAM too with Shimano having their XTR issues. P.S. I love my stumpy but dam I love that colour!! Excellent, because I often return from a ride with worn out thumbs. Power steering next please, and can they make it cost £5,000?